“We want to do something for the mining industry. There has never been Nordic cooperation in that field. Right now there’s a Klondike situation for mining in Sweden, Norway and Finland. If you include Greenland there’s a great Danish interest too,” says Ewa Björling, Sweden’s Minister for Nordic Cooperation. Nordic Labour Journal spent a few days travelling with Ewa Björling to Greenland. For most people this barren yet awe-inspiring part of the Nordic region is both beguiling and offensive. There is so much snow and ice, and so little green. But Ewa Björling grew up in the north of Sweden and loves the cold climate. Her father comes from the small town of Lahdenpää near Korpilombolo. That in turn is not so far from Pajala on the border with Finland. As we fly over Greenland’s icecap in the Swedish government’s plane we begin to realise how big the Nordic region really is if you include Greenland. The island makes up 63 percent of the total Nordic landmass. Yet sometimes the Nordic region is very small, like when you look at the questions being debated on a cross-country ministerial level. Ewa Björling is pleased with a new agreement which makes it possible to travel in the same taxi between border cities Haparanda in Sweden and Torneå in Finland. “Swedish taxi drivers are now allowed to travel into Finland and the other way around. Before you had to change taxies at the border if you wanted to follow the rules,” she says. She is particularly keen on reducing the number of border obstacles still present in that part of the Nordic region. The minister understands Finnish and can also speak the language relatively well after growing up in an environment where it was considered too posh to speak Swedish - even though everybody knew Swedish. The mood in the plane is good. Everyone is looking forward to experiencing Greenland. We have just had the best inflight meal I have ever tasted. Ewa Björling has said it is OK that we talk - as long as there is not too much turbulence. The plane once belonged to the head of Canadian whiskey company Seagram, and next to the seats, beneath the generously sized windows, are little circular holders perfect for a whiskey glass. 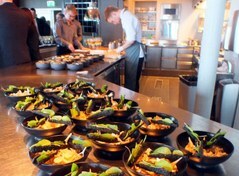 Ewa Björling’s blog "Frihandelsministern" [“the Free Trade Minister] focuses a lot on food. She has just been visiting the Carlsberg brewery and waxes lyrical about a surströmming party [surströmming is a Northern Swedish dish of fermented Baltic herring]. When she’s challenged to name her favourite food from any Nordic country she picks up the glove without hesitation. She has been Minister for Trade since 2007 for the Moderate Party, but became Minister for Nordic Cooperation only last autumn. Foodstuff issues are usually particularly tricky to handle. Just now she is agitated by the fact that Swedish food retailer ICA is prevented by Norwegian border rules from transporting Norwegian meat to their Swedish packing plant, which was built especially in order to maintain the highest possible standard. Other issues are easier to solve, like when Norwegian authorities wanted to tighten the rules for how foreigners are registered. Swedes commuting to Norway have for a long time held a temporary personal identification number. The new rules would force thousands of Swedes to become Norwegian residents because they spend more than six months a year in that country. That, in turn, would have serious consequences for their right to Swedish student grants, sick benefits and even their right to vote in Swedish parliamentary elections. “I thought the new Norwegian rules were no good. In Värmland alone there are 28,000 Swedes who commute to Norway. It is obvious that they should be allowed to choose themselves where they want to be resident,” she says. Ewa Björling immediately called her Norwegian opposite, Rigmor Aasrud, who immediately spoke to Norway’s Finance Minister Sigbjørn Johnsen. “This proves just how fast and easily problems can be solved in the Nordic region. But of course you also need to make a lot of noise in the media to get attention,” says Ewa Björling. Her Greenlandic colleague, Minister for Education Palle Christiansen, is hosting her visit to Greenland. 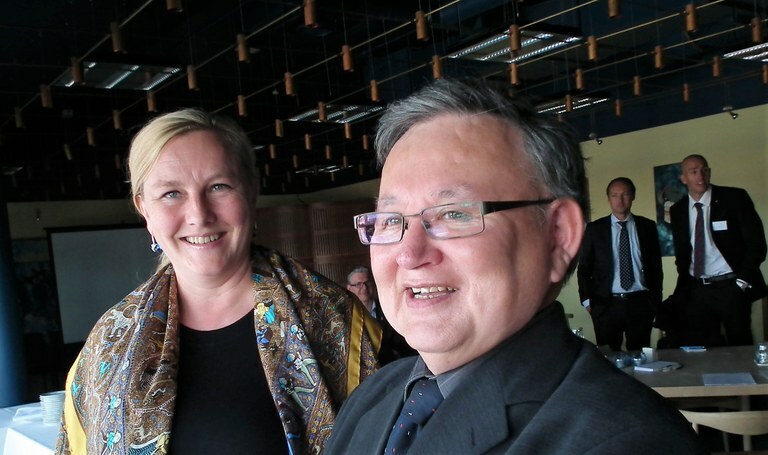 Until March this year he was Minister for Finance in Greenland’s devolved government, the Naalakkersuisut. The two share more than being Nordic cooperation ministers. Both are trained dentists, but Ewa Björling also took further training as a dental surgeon and became interested in research. She worked on lemmings, an animal which is at home in the Arctic. “It is very busy. It is hard to find time for my work as a dental surgeon, I had to look after my own research students and sometimes we even had to hold meetings in the Riksdag! Students at the mining school in Sisimut. To give the Greenland visit substance, as she puts it, she has also invited along a delegation of Swedish business leaders from the Swedish mining industry, like LKAB and Boliden. She can already reveal that the mining industry will be one of the main issues when Sweden takes on the presidency of the Nordic Council of Ministers in 2013. We want to do something for the mining industry. There has never been Nordic cooperation in this area. Right now there’s a Klondike situation for mines in Sweden, Norway and Finland. If you include Greenland there’s a large Danish interest too,” she says. So how does she envisage extended cooperation in the mining industry? Will it take the establishment of yet another Nordic institution? 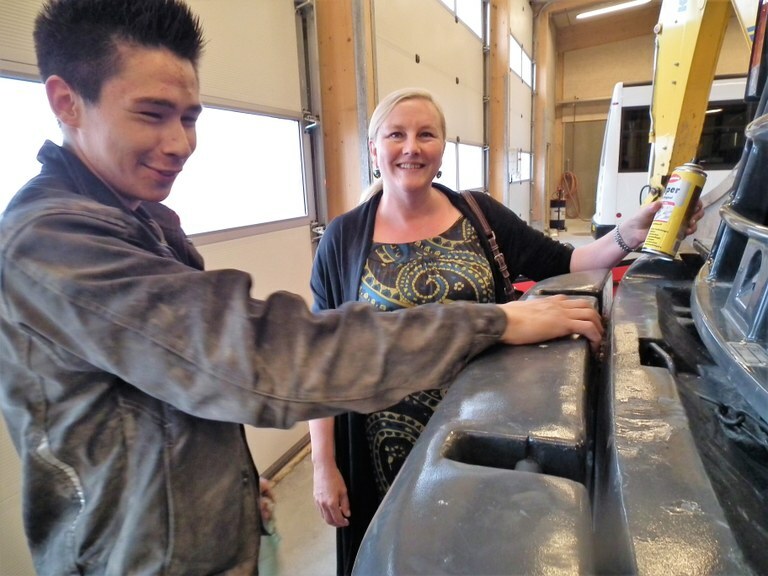 Most of her male relatives have been working for the Swedish mining company LKAB, and as soon as Ewa Björling has teamed up with the business delegation from Greenland’s second city Sisimiut, they’re straight off to the city’s new mining school. Greenland is currently the focus of great international interest from various mining companies. There are between six and seven major mining projects which could offer jobs to thousands of Greenlanders. But first they must be educated. Ewa Björling wastes no time striking up conversation with workshop trainee Aqqaluartaa. He is busy fixing a dent in one of the diggers. She spots a bottle of loosening oil which he has just put down. “In Sweden we call it a 5-56. Great for loosening rusted bolts. That and a roll of duct tape should be standard equipment in all cars,” she says. You can tell she’s been fixing cars before. Rumour has it she enjoys speed and she owns a Porsche 911. As Minister for Trade she has been particularly associated with one issue – the struggle for Swedish snus in the EU. But she prefers to talk about CSR – Corporate Social Responsibility. “Greenland has a lot coming and Sweden is but a small player in the boom which is about to hit the island. But increased cooperation with Sweden is obvious when you look at the sustainable strategy the Greenlanders have for their mining and oil industries. Swedish companies are world leaders in CSR,” she says. When she and the business delegation reach the capital Nuuk, however, she leaves it to the companies themselves to find contacts among the Greenlandic companies which are taking part in a seminar hosted by Sweden’s Copenhagen embassy and the Swedish Trade Council. After a one-on-one chat with energy minister Ove Karl Berthelsen at the seminar she is also introduced to a ‘kaffemik’, a Greenlandic tradition for chatting over a cup of coffee, alongside another ministerial colleague, Maliina Abelsen. She is the Minister for Finance and invites her home to her own house. 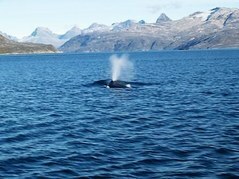 During the final dinner, on a sunny evening as a couple of minke whales spout water like a fountain in the Godthåp fjord outside the restaurant, she is asked whether she would consider living in Greenland. “I wouldn’t mind living in my own house near the water here, where it is cold and beautiful. But it would not be in Sisimut or Nuuk - but somewhere much smaller in between,” she answers diplomatically. Ewa Björling tries to spot a couple of minke whales which usually patrol the fjord outside Nuuk in Greenland. But she’s also hunting for new Nordic areas of cooperation (picture above). From Norway I choose brown cheese. I have a Norwegian goat’s cheese in the fridge right now. From Denmark I’d say butter. Like so many others I love Danish butter. But Danish salami is good too. Since I suffer from celiac disease I choose Finnish bread. They have a fantastic, dark bread. There is also a lot of game in Finland. Iceland and Greenland means fish and prawns. From Sweden the list is long: Elk, reindeer, caviar, Arctic char and surströmming. And the World’s best cheese - Västerbotten cheese.